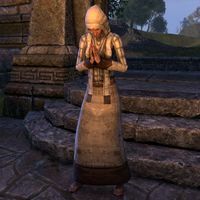 The Abbess is the spiritual leader of the Abbey of the Eight in Cyrodiil. An initiate will warn you not to disturb her while she prays to the Eight, but she will only offer generic responses if approached. This page was last modified on 17 March 2019, at 16:15.